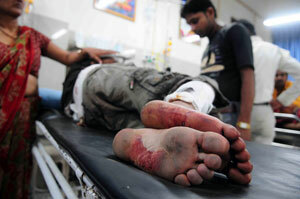 BLOODY FOOTPRINTS: A victim of the Janakpur blast being treated in Teaching Hospital on Tuesday. Monday's blast killed four people and the injured were flown into Kathmandu by Nepal Army's helicopter. There was a lot of hope after the war ended in 2006 that the country would finally have a new political landscape to ensure justice, peace and development. With just over a fortnight remaining for the CA deadline, there are good reasons for Nepalis to dread what 28 May holds for them. This week's deadly blast in Janakpur has sent a shiver of fear across the country, and the deteriorating situation in the Far West threatens to spill over into rest of Nepal. It may sound like an oxymoron, but only rational politics can defuse this time bomb. And we saw just such a stepping back from the brink in the announcement made late on Wednesday of the formation of a unity government. Historically, individuals have always been more powerful than institutions in Nepal. Ambitious regents orchestrated massacres to get to the throne. Warlords killed rivals to get to power. Autocrats backed by the army unseated democratic governments at will. And in these past weeks, a few ambitious leaders have shown that they can endanger democracy and disrupt social harmony just to fulfill their personal ambitions and greed. They exist in all four political forces in the country: leaders who put their personal ambition ahead of national interest. For them the negotiations over provisions in the new constitution are all about how their personal or party's prospects in elections will be affected. At a time when we need statesmanship, we have seen politics at its narrow-minded worst. Fortunately, we are seeing younger leaders within parties finally asserting themselves, and rising above partisan interests to persuade their leadership to make tough calls. The NC's Gagan Thapa is among the most vocal and puts it bluntly: "This is no time to bake individual cakes. Our priority now must be to complete statute drafting, if possible by participating in this government or by helping from outside." There is seething anger within Nepal's oldest party against its ambitious leaders who have a single-minded obsession to get to power. And now that the party has a chance to lead the government soon, we will probably see another re-enactment of the back-stabbing we saw last year. The Maoists are ravaged by a similar power struggle, but they have managed to keep the Baidya faction limited to occasional fiery speeches, without seriously challenging the leadership.The UML is also torn by internal rifts, and is waffling as usual. How these factions are accommodated in the present government at a time when leaders should be writing the constitution is worrying to say the least. What is even more outrageous is the NC's insistence that it should be allowed to lead a new government before 28 May. The parties have wasted past weeks unnecessarily fighting over government change. Now, the NC and UML being in government may help bridge the trust deficit, but it will not guarantee anything else. The parties will still have to find a form of governance acceptable to all, and on thorny issues like electoral system and state restructuring they have to remain above narrow partisan interests to fit the demands of Janajatis, Madhesis and Dalits without endangering future stability and social harmony. Most importantly, the parties must be responsible enough to appreciate the lurking dangers in Nepal's political transition. Monday's bombing was targeted at a larger crowd to create greater mayhem and upset the country's delicately balanced ethnic mingling. The parties must defuse this explosive situation by finishing statute drafting in the next three weeks and ending the protracted transition so that we can close this chapter and move on. What a cry! I want to do the same but who wants to listen?